NEW HAVEN – “…Slicing through the clear blue sky, a previously unknown absolute evil is unleashed on Hiroshima, instantly searing the entire city. Koreans, Chinese, Southeast Asians, American prisoners of war, children, the elderly and other innocent people are slaughtered. By the end of the year, 140,00 are dead.” – from the Hiroshima Peace Declaration. Around the world, peace vigils and actions on Aug. 6 and Aug. 9 commemorated the 71st year since the first atomic bombs were dropped, destroying Hiroshima and Nagasaki, Japan. 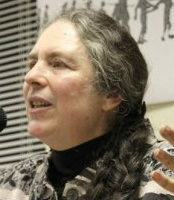 In the United States gatherings and petitions called for an end to nuclear weapons. Before leaving for their daily appointments, those present signed letters to Democratic Sen. Richard Blumenthal of Connecticut asking that he vote and take leadership in the fight for abolition of nuclear weapons, and use those resources for human needs. “1945, August 6, 8:15 a.m. Slicing through the clear blue sky, a previously unknown “absolute evil” is unleashed on Hiroshima, instantly searing the entire city. Koreans, Chinese, Southeast Asians, American prisoners of war, children, the elderly and other innocent people are slaughtered. By the end of the year, 140,000 are dead. “Those who managed to survive suffered the after-effects of radiation, encountered discrimination in work and marriage, and still carry deep scars in their minds and bodies. From utter obliteration, Hiroshima was reborn a beautiful city of peace; but familiar scenes from our riversides, patterns of daily life, and cultural traditions nurtured through centuries of history vanished in that “absolute evil,” never to return. “Seventy-one years later, over 15,000 nuclear weapons remain, individually much more destructive than the one that inflicted Hiroshima’s tragedy, collectively enough to destroy the Earth itself. We now know of numerous accidents and incidents that brought us to the brink of nuclear explosions or war; today we even fear their use by terrorists. “Is it not time to honor the spirit of Hiroshima and clear the path toward a world free from that “absolute evil,” that ultimate inhumanity? Is it not time to unify and manifest our passion in action? This year, for the first time ever, the G7 foreign ministers gathered in Hiroshima. 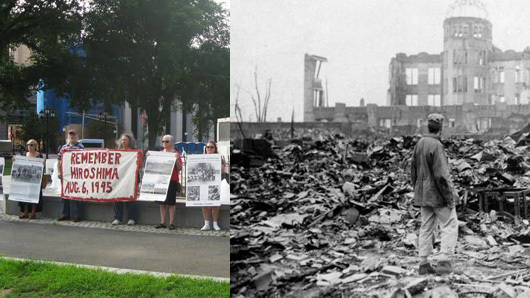 Transcending the differences between countries with and without nuclear weapons, their declaration called for political leaders to visit Hiroshima and Nagasaki, for early entry into force of the Comprehensive Nuclear-Test-Ban Treaty, and fulfillment of the obligation to negotiate nuclear disarmament mandated by the Nuclear Non-Proliferation Treaty. This declaration was unquestionably a step toward unity. “We need to fill our policymakers with the passion to solidify this unity and create a security system based on trust and dialogue. To that end, I once again urge the leaders of all nations to visit the A-bombed cities. As President Obama confirmed in Hiroshima, such visits will surely etch the reality of the atomic bombings in each heart. Along with conveying the pain and suffering of the hibakusha, I am convinced they will elicit manifestations of determination. “The average age of the hibakusha has exceeded 80. Our time to hear their experiences face to face grows short. Looking toward the future, we will need our youth to help convey the words and feelings of the hibakusha. Mayors for Peace, now with over 7,000 city members worldwide, will work regionally, through more than 20 lead cities, and globally, led by Hiroshima and Nagasaki, to promote youth exchange. We will help young people cultivate a shared determination to stand together and initiate concrete action for the abolition of nuclear weapons. “Here in Hiroshima, Prime Minister Abe expressed determination “to realize a world free of nuclear weapons.” I expect him to join with President Obama and display leadership in this endeavor. A nuclear-weapon-free-world would manifest the noble pacifism of the Japanese Constitution, and to ensure progress, a legal framework banning nuclear weapons is indispensable. In addition, I demand that the Japanese government expand the “black rain areas” and improve assistance to the hibakusha, whose average age is over 80, and the many others who suffer the mental and physical effects of radiation.